Indian Prime Minister Narendra Modi speaks during the inaugural ceremony of 'Make in India' week in Mumbai, India, Saturday, Feb. 13, 2016. The ‘Make in India’ week hosted in Mumbai attracted political and business leaders from all over India and foreign investors, current and potential. Several Russian companies attended the event, meeting potential partners to co-manufacture in India. 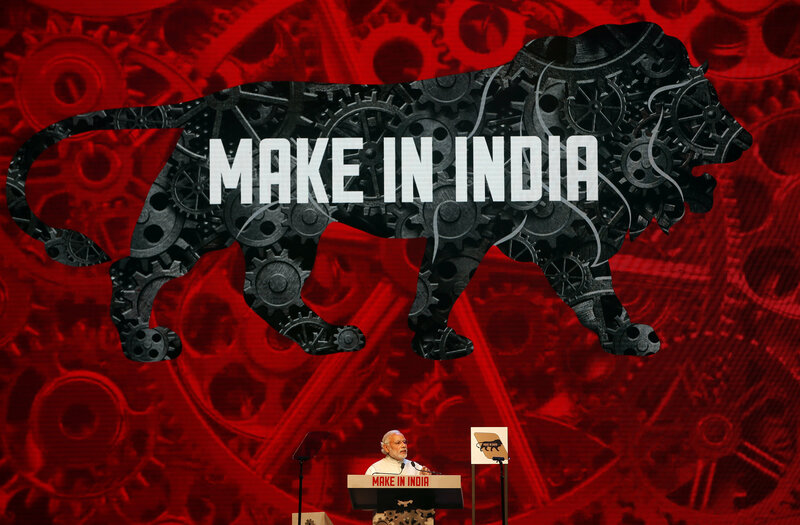 The ‘Make in India’ initiative articulated by Indian Prime Minister Narendra Modi in September, 2014 has been brought to an entirely new level after a week-long event organised in India’s premier financial hub, Mumbai. With visitors from over 60 countries and more than 2500 international and 8 000 domestic companies participating in the event, the opening ceremony was inaugurated by the Indian Prime Minister. The Prime Ministers of Sweden and Finland, Deputy Premier of Poland and other foreign ministers attended the inaugural of the massive showcase of India’s investment potential across sectors and industries. From automobile, aviation and defence, pharmaceuticals and biotechnology, oil and gas to food processing, IT and robotics, ‘Make in India’ Week covered all sectors where foreign companies can explore new opportunities. Amitabh Kant, Secretary in the Department of Industrial Policy and Promotion (DIPP) said in his closing address that ‘Make in India’ Week had been a great success and resulted in overall investment commitments of US$ 222 billion. The Indian government’s idea is to attract foreign investors to set up shop in India, engage in co-production and technology exchange with local companies. Various ministries and departments, government agencies and services will work round the clock to make India attractive for opening new business. A more transparent and predictable tax regime and an effective patent and intellectual property regime would be put in place, while labour issues and land acquisition procedures would be resolved and skills of the labour force improved. “India is blessed with three “D”s: Democracy, Demography and Demand," Modi said in his inaugural address. He suggested adding a fourth “D”: Deregulation in order to achieve India’s ambitions to become the investment hub of the world. Speaking to RIR on the sidelines of the event, Union Commerce and Industry Minister Nirmala Sitharaman said, “Russia is a very important country from whom we have been importing a lot of goods inclusive of defence so Russian investments here, Russian participation here, Russian industries coming and producing in India will be of great relevance to us”. She said India is “on track” for a free trade agreement (FTA) with the Eurasian Economic Union to provide India greater access to markets in Russia and some CIS counties. India recently shared the first draft of the joint study group report on the feasibility of such a pact with the five-nation bloc. Although Russia, unlike many other counties including the USA, Sweden, Poland, Germany and Korea, did not participate in ‘Make in India’ exhibition directly, and no Russian equipment was showcased, several Russian companies from various sectors used the event to connect with Indian companies and foreign partners. For Road Construction Machinery Factory LLC, one of Russia’s leading manufacturers of road rollers and other special purpose machines for road construction located in Rybinsk, Yaroslavskaya region it was the second visit to India. Pavel Kuznetsov, Company CEO, said India is not an easy market since major American and European brands have already established business here. A price sensitive market, India had posed challenges to Road Construction Machinery Factory since its products were not price competitive. However, current economic realities in Russia are helping the company market its major products in India and other Asian counties, Kuznetsov said. “We are planning to meet several companies in India and also in Bangladesh where companies have shown interest in our products. Weak ruble may help us tap Asian markets this time,” Kuznetsov told RIR. Another company from Yaroslavl region, Electronika, providing systems for security management of buildings and industrial facilities, arrived in India to sign deals with Indian companies that had shown interest in its unique technologies. CEO Nikolay Ovchenkov said Electronika is among just few companies globally with innovative technology solutions for industrial and strategic facilities’ security audit and protection. Electronika provides solutions based on Physical Security Information Management (PSIM) that sees information from various security systems as data that needs to be contextualized and analysed for further decision making. “Company’s solutions are used to secure strategic facilities having advanced demands on security in many areas from transport sector, airports and railway stations, to energy complexes, industrial parks, banking institutions and other facilities,” Ovchenkov said. In 20 years Electronika has executed almost 100 projects across Russia and CIS countries, Equatorial Africa (Guinea) and Eastern Europe (Bosnia and Herzegovina) and a security and control centre for Sochi International Airport, air gateway for the 2014 Winter Olympics. “We have recently participated in a large industry event in OAE where we met some Indian partners who were very interested in our technology, which is quite unique in the market. Finalising cooperation plans with these partners is our main goal for this Indian tour,” Ovchenkov told RIR. Alok Kumar, Chairman of Akis Tech Ltd, a company based in Moscow, London and Hong Kong, specialising in IT and technology, chemical trading, contact manufacturing of consumer electronics, headed the Russian delegation at ‘Make in India’ Week. Kumar told RIR it was the right time for Russian manufacturers to find partners in India since both countries are keen on developing manufacturing skills and facilities and increasing exports to third countries. Alxander V. Shutov, Director, Investment and Marketing Department at Yaroslavl chamber of commerce and industry, and a frequent visitor to India, said the course on inter-state cooperation taken by governments of both India and Russia can help their businesses build better cooperation. The Yaroslavl delegation has actively participated in Indo-Russian trade events, including Vibrant Gujarat forum and India-Russia Business Dialogue that takes place in Moscow yearly. “The cooperation with Indian companies and state government is already happening in major sectors like pharmaceuticals, IT, manufacturing,” Shutov told RIR. Sergey Lunev, head of the Russian Trade representation office in Mumbai believes there are many sectors apart from defence and energy where Russia and India already cooperate. “Pharmaceuticals, electronics, IT are such sectors. The robotics sector showcased at this event, it is very impressive,” Lunev said. Russia’s importance as a strategic partner and investor for India was pointed out in positive comments by officials on India-Russia cooperation in the defence and energy sectors. The Economic Times newspaper reported that the long-delayed Indo-Russian project to develop a new fifth generation fighter aircraft was pushed by Defence Minister Manohar Parrikar and talks revived with a senior team from Russia arriving in Delhi. The Indian media also reported that “Russian Helicopters” currently showcasing equipment at the Singapore Airshow 2016, plans to sign up with Hindustan Aeronautics Ltd (HAL) and other manufacturers to make 200 helicopters, most of which will be made in India under an inter-government pact signed during the December summit in Moscow.